Click the gear icon, then choose "Edit Profile" or "Settings". Click your name (next to the notifications bubble) to open the drop down menu, then click "Edit Settings". 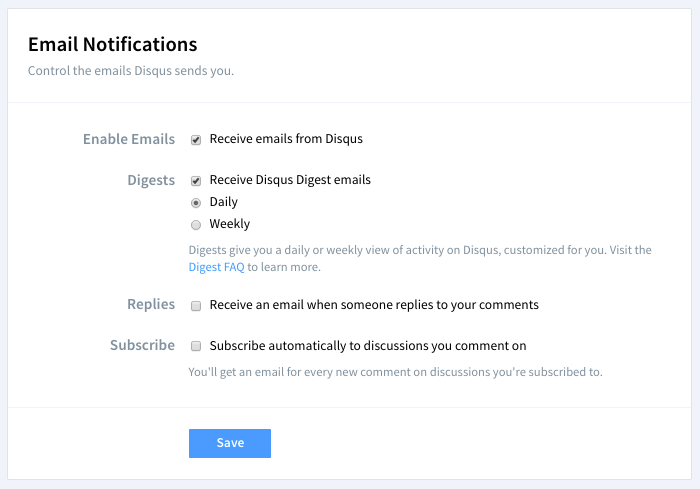 Once you've accessed your Disqus settings and navigated to the Profile tab, you'll then be able to edit your Avatar, Name, Website, Location, Bio, and Privacy Settings. Note that the Name in your profile refers to your display name, which is different than your Username. Your Name appears in your profile and is shown with your activity in Disqus. Your username appears in the URL of your profile and is used for logging in. 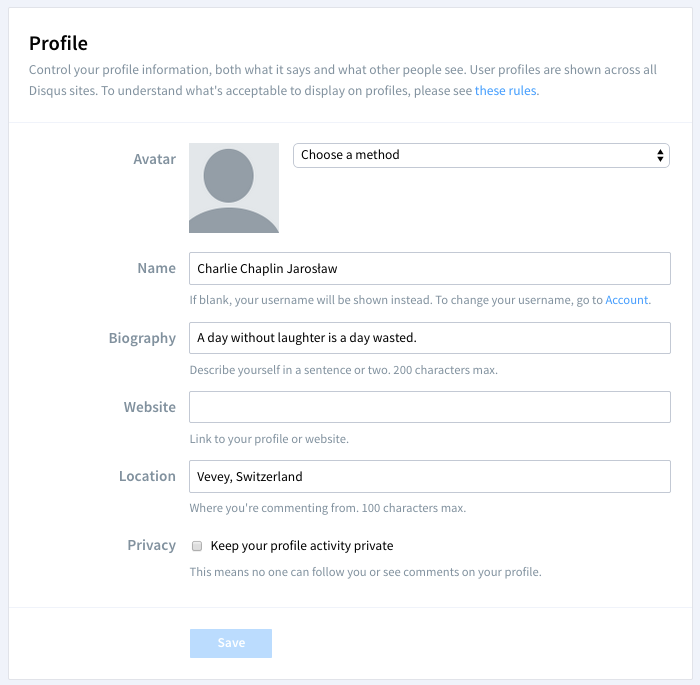 You can manually update your avatar by uploading a picture from your computer, connecting to Disqus through Facebook or Twitter, or by selecting an existing Gravatar. All of these options can be found in the Profile settings shown above. File size limit: 1 megabyte. Transparent avatars are not supported. We're working on that. Gravatar image not showing up in Disqus? If you are using the same email address for both Disqus and Gravatar and your Gravatar image is still not appearing in Disqus, check to be sure that your email address in Disqus is in all lower-case letters. In your Account Settings, you can update your email address, username, and password. Email - used for email notifications and for verifying your account. Connected accounts are links to your social networks such as Facebook, Twitter and Google. 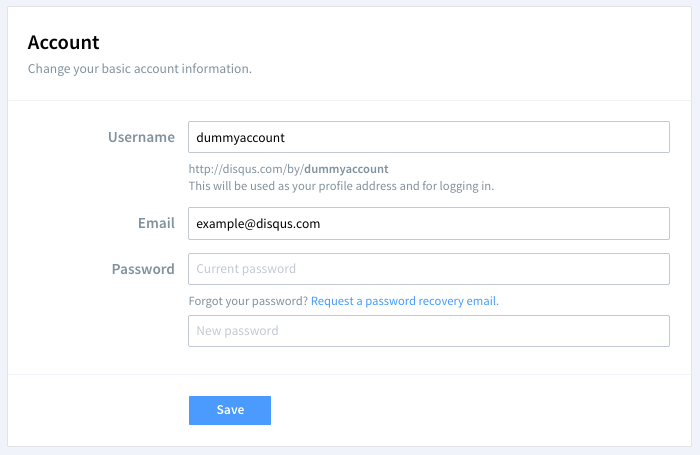 By linking to a service, you are able to log into Disqus with your social account. As of April 2015, your social account link will no longer appear publicly in your Disqus profile. 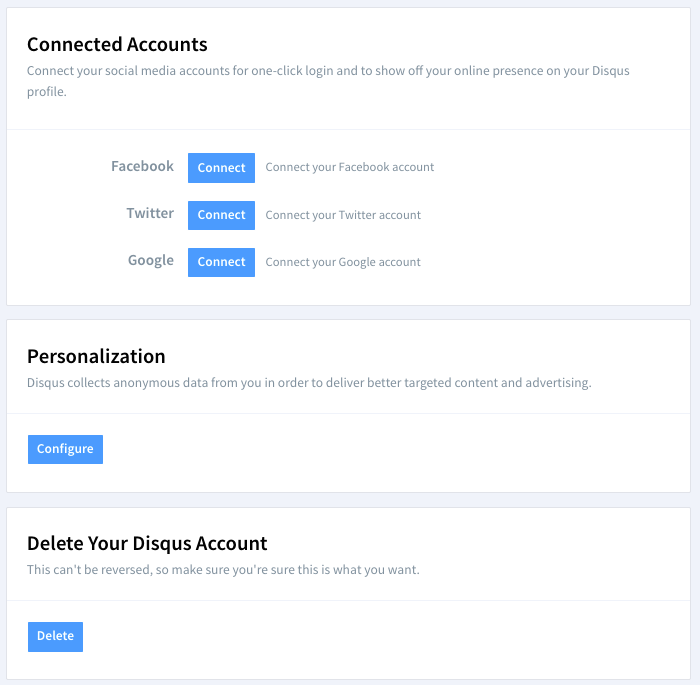 On this page, you can also manage your Data sharing settings or permanently delete your Disqus account. Important: We completely remove all of your data when you delete your account. While we do retain your comments for context purposes, your comments are completely anonymized to remove all traces of your personal information. Deleting your account also removes all Disqus sites you own and their respective comments. Email notifications are sent when comments are posted on discussions that matter to you. You can modify what types of emails are sent to you, or completely unsubscribe in your Email Notification settings. Not receiving your notifications or having trouble unsubscribing? Please see Troubleshooting Email Notifications. Web notifications for things like replies, upvotes, new followers, and invites to discussions show up in your Inbox. In the Web Notifications settings, you can control which ones you want to see. 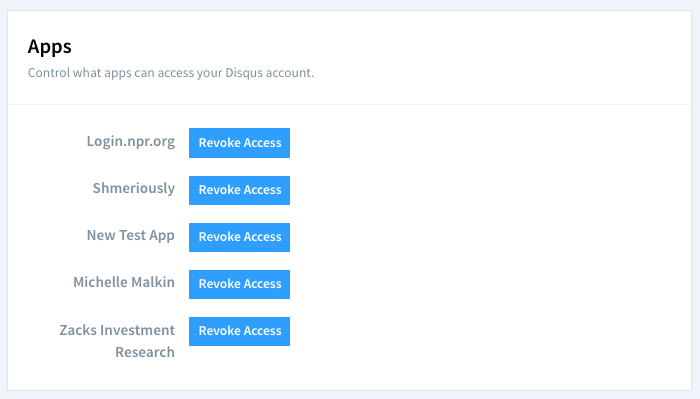 If you have granted any 3rd party apps access to your Disqus account, they will appear in your Apps settings and can be revoked if needed. 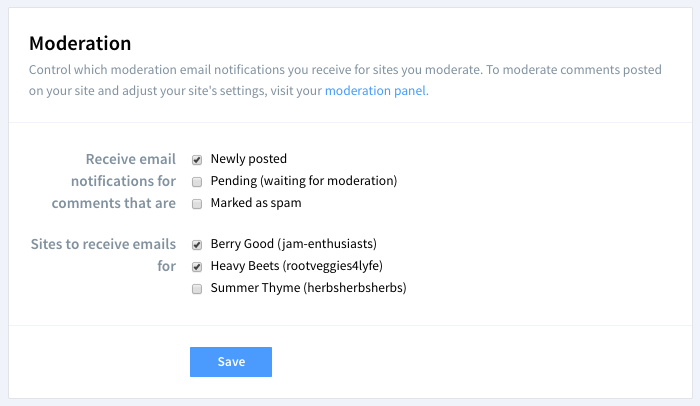 If you are a moderator on a Disqus forum, you can configure your email notifications for each forum in your Moderation settings. If you'd like moderators on your site to receive flagged comment notifications in addition to their other moderator notifications, enable "Email moderators when a post is flagged" in your forum settings at Settings > General > Community Rules.